Holgate Windmill in York, UK was built in 1770, milled grain until the 1930s and then fell into disuse. In 2001 the volunteers of the Holgate Windmill Preservation Society began restoring the mill to working order. It is now open to the public (see their website) and once again produces flour. Set in open countryside when it was built, as the city of York has expanded the windmill has been surrounded by housing. From its position on a traffic island at the top of a hill, it looks down on York. 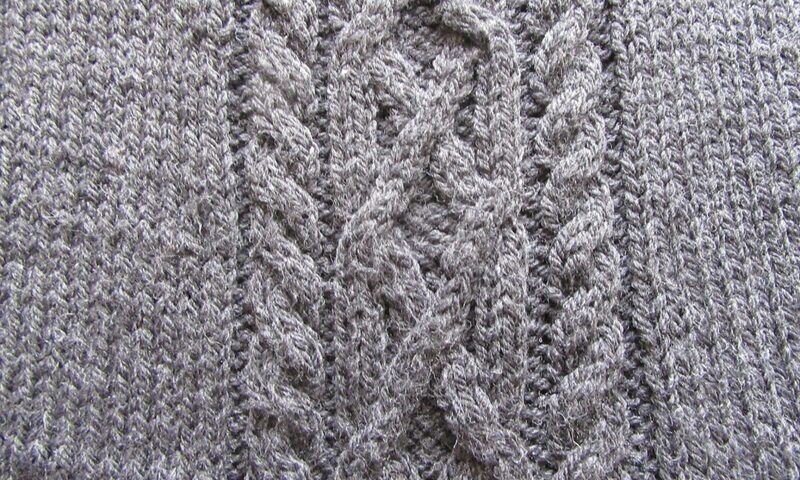 This t-card lets you apply your “KnitShop” skills to improve the image. You can easily spot the modern road and houses in the photograph – and if you look more closely there is a lamp post behind the tree on the left. These are easily hidden with a covering of green wool – that would also emphasize the structure of the windmill itself. 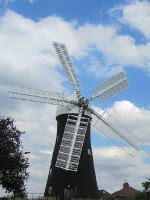 The windmill is one of only two surviving in the UK with a set of five sails – and the only one that has shutters on both sides of the central beam of each sail. You could practice a ladder stitch to mimic the shutters on the sails – as always, it is up to you to decide.